A year ago, in my post “I’m skeptical about … arthroscopic knee surgery,” I reviewed several randomized controlled trials demonstrating that for degenerative arthritis of the knee, arthroscopic surgery doesn’t help. In the first of the studies from a VA center in Houston, veterans undergoing sham surgery (incisions into the knee without any therapeutic procedure) did just as well as those undergoing real surgeries for degenerative arthritis of the knee. Then, a Canadian study demonstrated that physical therapy alone conferred the same benefit as arthroscopic surgery. Even more concerning, there are multiple studies calling into question whether physical therapy works any better than simply losing weight and walking. Everybody reports improvement over time. In the face of overwhelming evidence, Medicare ceased reimbursement for arthroscopic surgery to treat degenerative knee arthritis in 2004, but this hasn’t led to a reduction in knee surgeries. Graphic depicting a normal knee versus a knee with osteoarthritis. Why? Because up to 90% of people aged 60 and older also have concomitant tears in the shock-absorbing cartilage of their knees (particularly the inner pad known as the medial meniscus). So, the indication simply changed from “degenerative arthritis” to “medial meniscus tear,” and the orthopedists operated merrily on. But a Swedish trial published in 2007 followed by a larger NIH sponsored US trial found no difference in outcomes between patients randomized to surgery and exercise versus exercise alone. Then a Finnish trial found no difference in outcomes between patients undergoing sham surgery versus therapeutic knee surgery for medial meniscus tears. (Why is it that the Nordic countries are leading the way? Perhaps because with universal health care they have a vested interest in finding out what works and what doesn’t, whereas our for-profit health care system is mostly about paying for procedures? Hmmm.) This is not to say that surgery isn’t still the best treatment for traumatic meniscus and ligament injuries, but the majority of arthroscopic knee surgeries in this country are performed for chronic conditions where benefit likely doesn’t exist. Now, yet another study (again from Norway), has shown no benefit to surgery versus physical therapy for chronic meniscus tears. The trial, published earlier this year in a July issue of the BMJ (British Medical Journal), randomized 140 adults with MRI proven medial meniscus tears, but without significant knee arthritis, to either 12 weeks of exercise versus arthroscopic surgery, and then followed them out for 2 years. The exercise group actually fared better than the surgery group on knee strength testing at 3 months, but by 2 years there were no differences in pain, function, or knee-related quality of life (i.e. sports participation). Now a lot of people with knee pain might be thinking that they’re incapable of entering an exercise program, but the Norwegian study had patients attend just 2 to 3 supervised sessions per week for 12-weeks—not very rigorous. Patients were allowed to cross over and have surgery if they were unhappy with the results and 19% of them did—but to no added benefit over those who simply stuck to the exercise program. Arthroscopic photo of the author’s knee showing a chondral fracture just to the right of center on the distal femur. Medical waste? This surgery didn’t help me. Just last night I was talking to a friend recovering from arthroscopic surgery for chronic knee pain: “My doctor said I had to have the surgery.” She was, fortunately, feeling better and hadn’t suffered any surgical complications. Since there is a huge placebo effect to surgery, I didn’t have the heart to say anything, but of course it was the patient and not the doctor who had demanded the surgery. Remember that if you go to a surgeon, whose business it is to operate, and say, Please, please help me, the chances are you’re going to wind up in the OR. The orthopedist is a hammer, and patients are nails. Don’t demand an MRI (that will almost certainly demonstrate a meniscus tear if you’re older than 6o), and try to stay away from orthopedic surgeons in the absence of an acute injury. For chronic pain, see a physical therapist, exercise physiologist, or certified personal trainer. Weight-bearing exercise improves pre-existing disease and delays the development of arthritis. So empower yourself and take responsibility for your body: it’s the only one you have. Nina Jullum Kise et al., “Exercise Therapy Versus Arthroscopic Partial Menisectomy for Degenerative Meniscal Tear in Middle Aged Patients: Randomised Controlled Trial with Two-Year Follow Up,” BMJ 2016; 354: i3740. B. Thorlund et al., “Arthroscopic Surgery for Degenerative Knee: Systematic Review and Meta-Analysis of Benefits and Harms,” Br J Sports Med 2015; 49: 1229-35. Teppo Jarvinen and Gordan Guyatt, “Arthroscopic Surgery for Knee Pain: A Highly Questionable Practice Without Supporting Evidence of Even Moderate Quality,” BMJ 2016; 354: i3934. 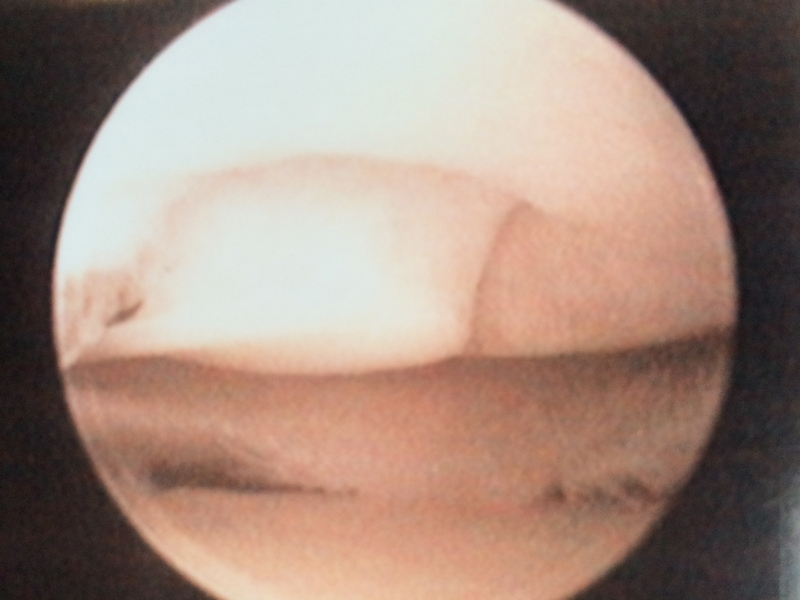 This entry was posted in Uncategorized and tagged arthroscopic knee surgery, knee osteoarthritis, medial meniscus. Bookmark the permalink.